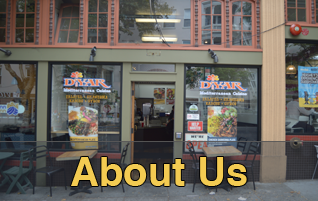 From UC Berkeley’s North and south Gates, Dyar Mediterranean Cuisine offer fresh made-to-order wraps and plates. 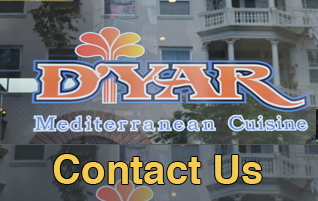 A family-owned and operated restaurant, Dyar Mediterranean Cuisine serving delicious authentic flavors from the Mediterranean Coast to the Middle East. Everything we serve is fresh and homemade, and served to you in a beautiful atmosphere with fresh produce. (Northside) 1866 Euclid Ave Berkeley, CA 94709. Click here to contact us and order your food. "Their falafels (btw, I recommend the Falafel Deluxe) MELT IN YOUR MOUTH, and it is amazing." The pita bread is soft and lightly grilled, and the plates come with hummus, salad and rice." 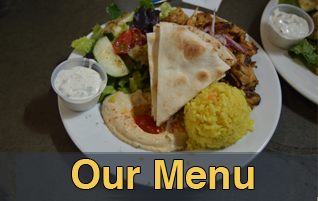 "I've only tried the Chicken Shawarma plate and from my experience, it tasted great!" I got the chicken shawarma with rice on the side. It came down to about $7.50, and I wasn't disappointed at all. The plate comes with a scoop of seasoned rice, chicken shawarma, a small salad, 4 pita bread triangles, and hummus spread. The bread and hummus complement each other nicely. The salad comes with ranch dressing, and it's not too special (lettuce, grape tomatoes). And last but certainly not least, the chicken shawarma. IT'S REALLY FLAVORFUL. The red onions and spices that come with the meat are excellent flavor boosters. Just go try it for yourself. You won't be disappointed. Overall, you get a tasty, filling meal for a reasonable price. I'm a huge fan of Mediterranean food now because of D'Yar. I have been introduced to the wonderful world of schawarmas and falafels. The food here is delicious and incredibly filling. If you go around peak times (ie. lunch time and dinner time) you'll have difficulty finding a seat inside the restaurant so I recommend just getting your food to go. In terms of what I recommend on their menu you can't go wrong with their chicken schawarma plate which I believe is their most popular item. For vegetarians, definitely try the falafel wrap and skip out on the hot sauce (in my opinion it's overpowering and masks any flavor from the falafels themselves). You'll need your appetite if you buy any of their 'plates' because it comes with pita and fries and rice and tahini and hummus and salad and so on. The prices are reasonable in my opinion and aren't much different from the prices you get in Asian Ghetto or any other Southside restaurant. All in all, fantastic food for reasonable prices!